Sherline industrial components can be combined in many ways to create custom tooling to meet your special needs. 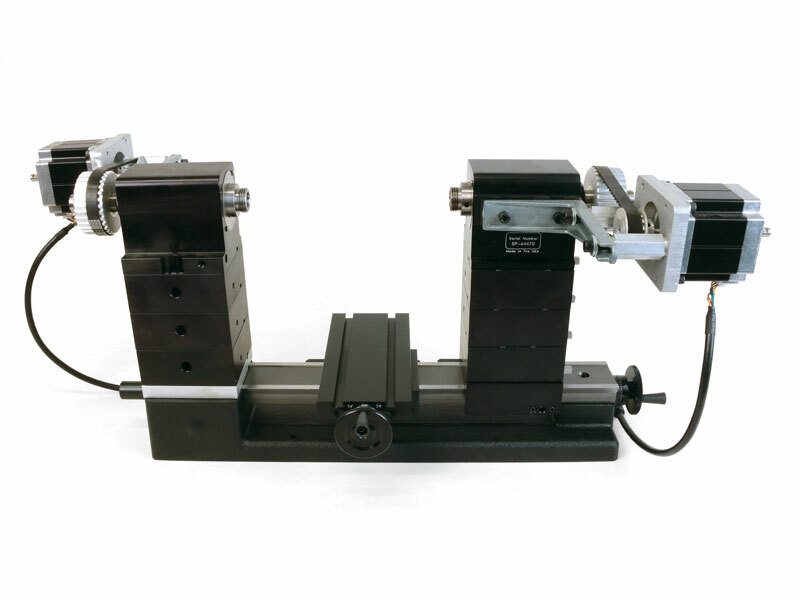 In addition, we can design and manufacture custom components to make tooling for unusual needs that go beyond the scope of our normal parts stock. Below are some of the custom machines we have put together for customers who had needs that could not be met by off the shelf parts. If you have any questions about the feasibility of your proposed project or the capabilities of our equipment, call us at (800) 541-0735 or (760) 727-5857. The best time to call is Monday through Friday between 11 AM and 3 PM (Pacific). Please ask for Karl Rohlin or Charla Papp. 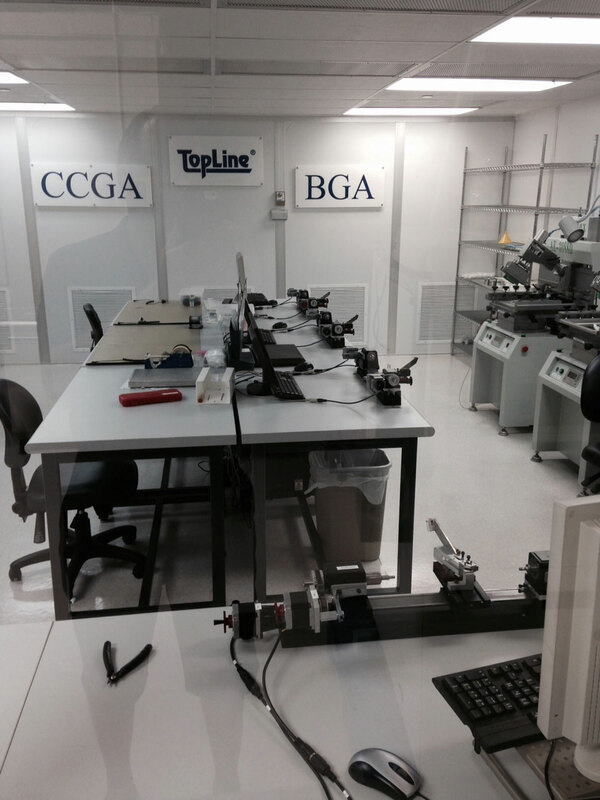 Following is a list of the types of custom machines that Sherline has built for various companies and colleges. Scroll down, or CLICK HERE to see some examples of custom designed machines. To see which companies and colleges are using Sherline products CLICK HERE. Many of the custom machines shown on this page use stepper motors to rotate work, rather than using a standard AC or DC motor. 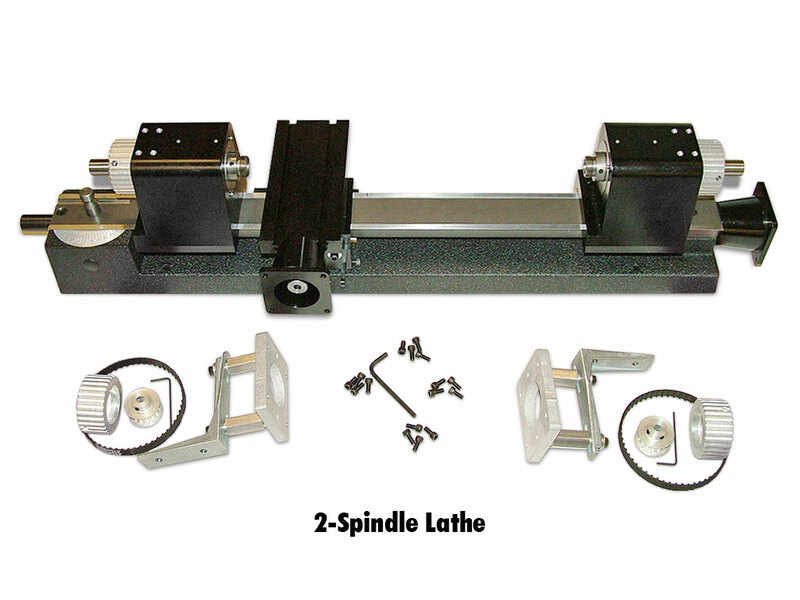 Some customers want to rotate two opposing spindles in the same direction, at the same speed. 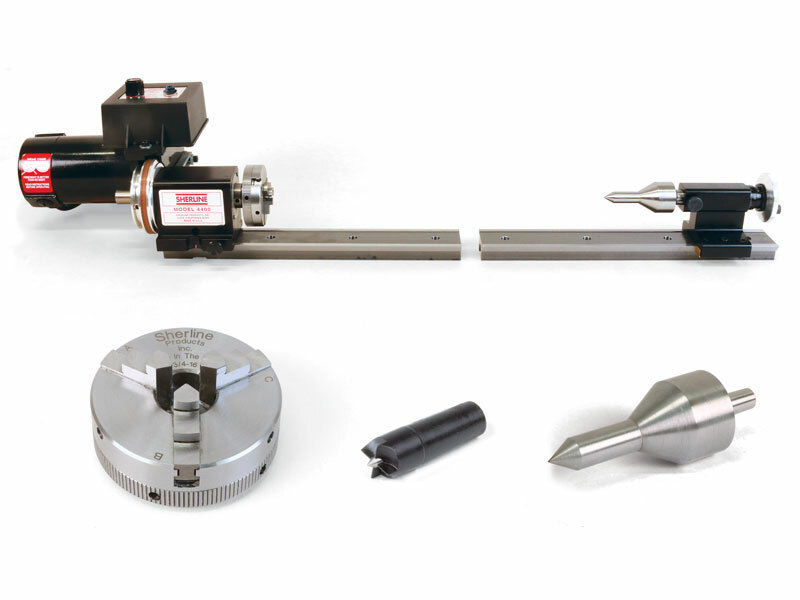 Some customers want to rotate the spindle at a lower speed than is possible with an AC or DC motor. 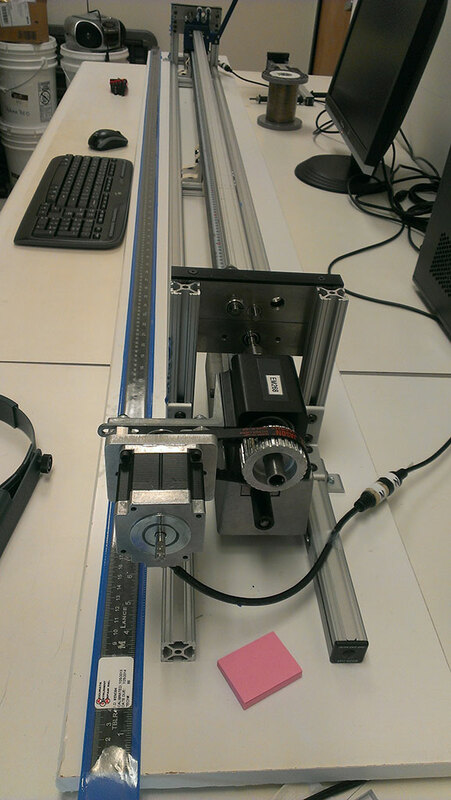 If running multiple stepper motors they will need to be driven with a CNC system. 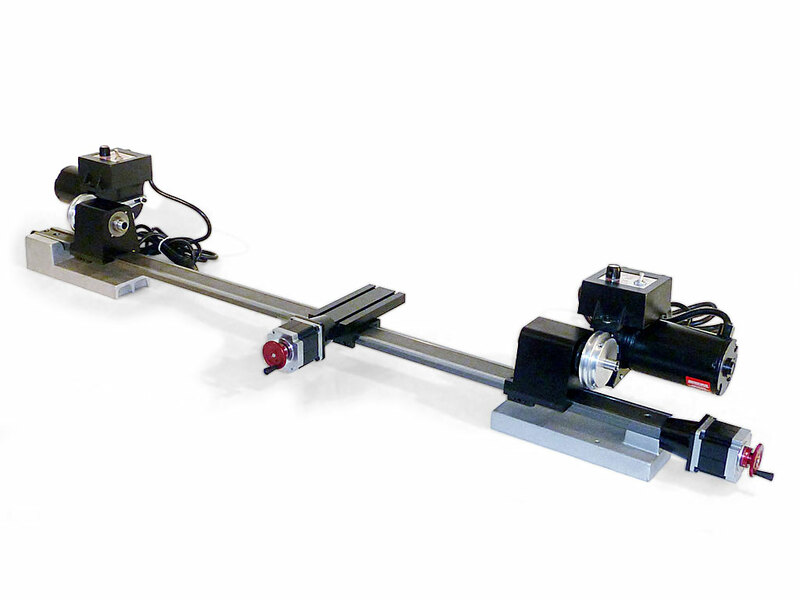 If a single stepper motor is being driven you can either use a CNC system or one of our linear controllers. If you are using our linear controller, you can adjust the feed rate on the “Settings” page. NOTE: This setup is intended for rotating spindles only, not for machining work held in the spindle. Feed rates can be set from 1 IPM (inch per minute) to 25 IPM. When using a 15 tooth cog pulley on the stepper motor and a 30 tooth cog pulley on the spindle you can achieve spindle RPM’s of 10 to 240. 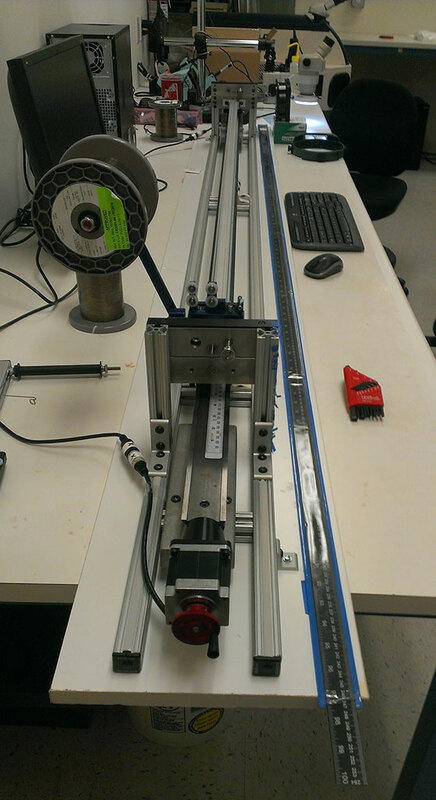 To the right is a list of feed settings on the linear controller and the associated spindle RPM. NOTE: The RPM’s stated are approximate. A standard model 4400 Sherline lathe was modified to mount an industrial tapered headstock in place of the tailstock. The headstock end was raised with a custom riser block to align the centers. A NEMA 23 stepper motor mount was fitted to each headstock. One motor was run clockwise and the other counter-clockwise using the stepper motors to control speed while a wire was wrapped around a mandrel. The crosslide is adjusted manually with a handwheel. 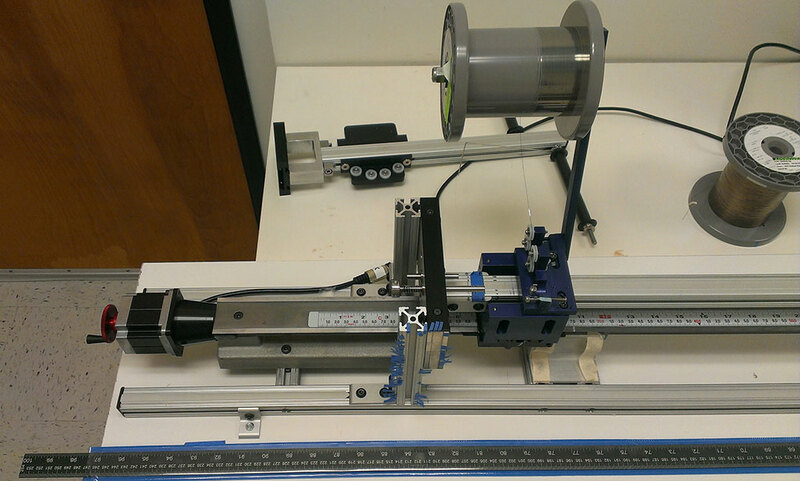 Similar to the above lathe, this one utilizes two industrial headstocks with one moveable by means of a stepper motor. The headstocks are driven by NEMA 23 stepper motors. The crosslide also has a mount for a NEMA 23 stepper motor. This style of machine can be used for glass blowing, laser welding, soldering, or wrapping operations. The headstocks are driven by NEMA 23 stepper motors. You can build your machine with options customized to fit your needs. Contact us to request a quote. 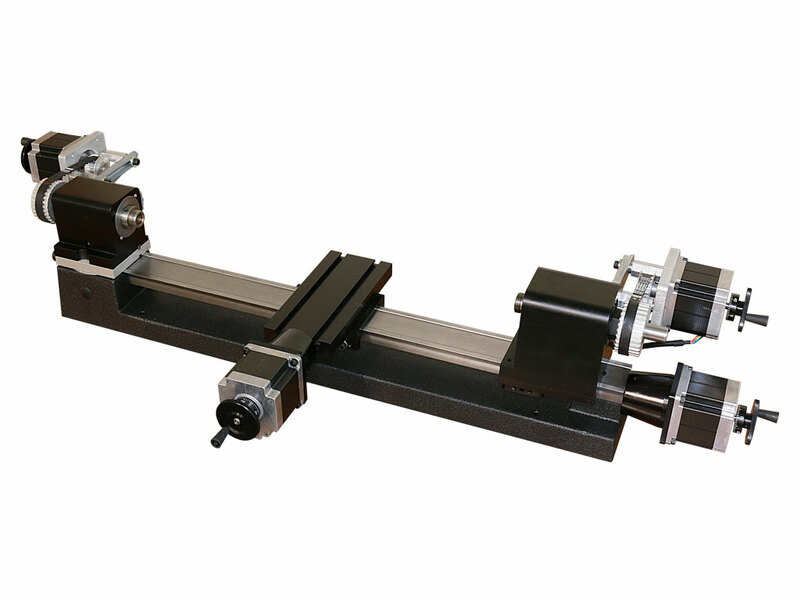 A part is rotated between two NEMA 23 stepper motor driven headstocks located at each end of the lathe bed. 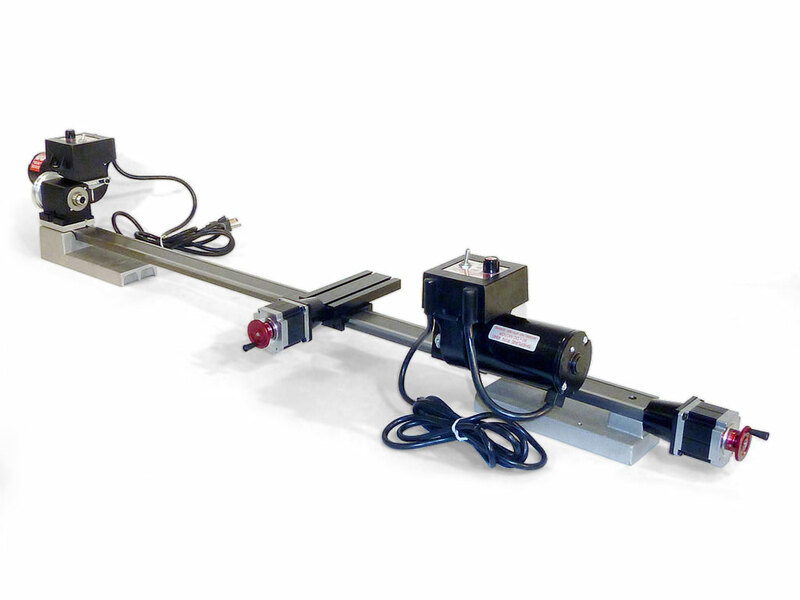 The crosslide is also controlled by a NEMA 23 stepper motor. A stepper motor on the long axis drives the saddle leadscrew. Sherline can also provide the computer and drivers to drive up to four stepper motors using industry standard G and M codes. The 3D RAR file includes both an IGES and a STEP file. Similar to above but with DC spindle motors mounted to each headstock for higher speeds. One motor is custom mounted on the opposite side of the headstock so they both turn the part in the same direction. The crosslide is stepper motor controlled. Similar to above but with one spindle motor at each end, turning in opposite directions or in same direction if current to one motor is reversed. If you are interested in an extended lathe, call us at (800) 541-0735 or (760) 727-5857. The best time to call is Monday through Friday between 11 AM and 3 PM (Pacific). Please ask for Karl Rohlin or Charla Papp. We are now offering a Split Bed Pool-Cue Lathe, in addition to our custom Extended Bed Lathe. 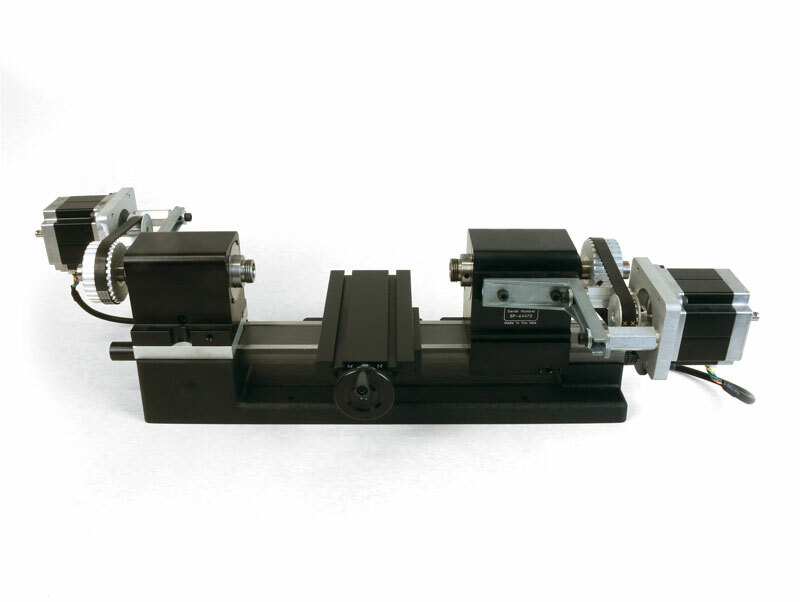 This Split Bed Lathe setup allows custom pool cue makers the ability to adjust the distance between the headstock and the tailstock, depending on the length of the stock being turned, without the expense of ordering a custom extended lathe bed. 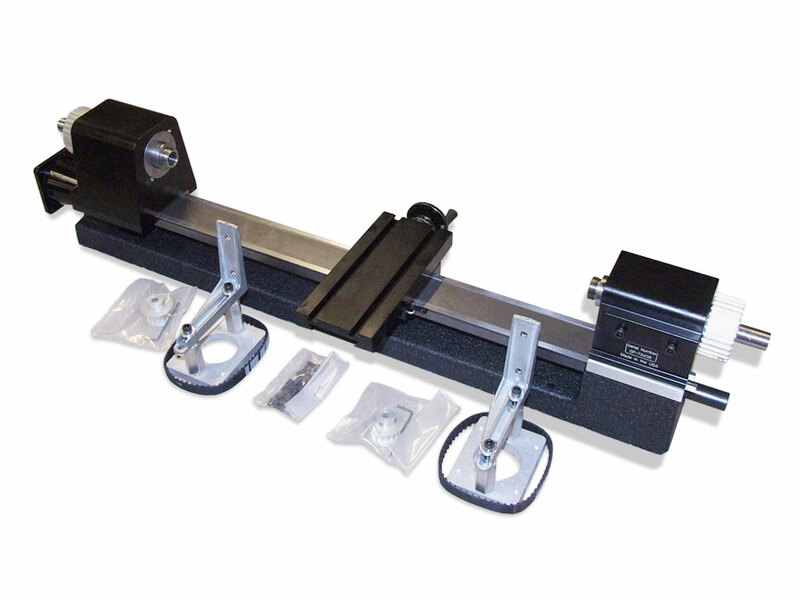 The Split Bed Lathe comes with a customized headstock and tailstock attachment beds, a headstock and motor unit, a tailstock assembly, a pool-cue live center, a spur driver, a 2.5" chuck, and screws for mounting the lathe beds. Using two Sherline rotary tables and a number of custom machined parts, this special machine was built to the customer's specifications. 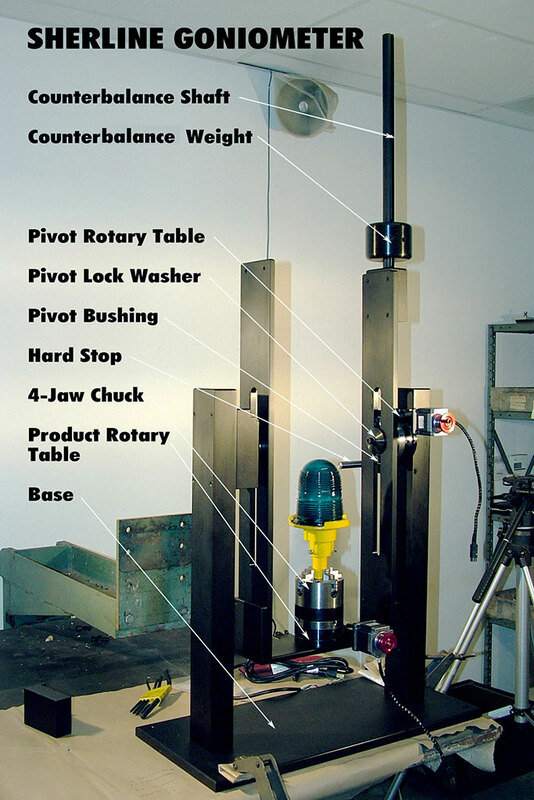 A product can be rotated and swung through an adjustable arc for examination and testing. 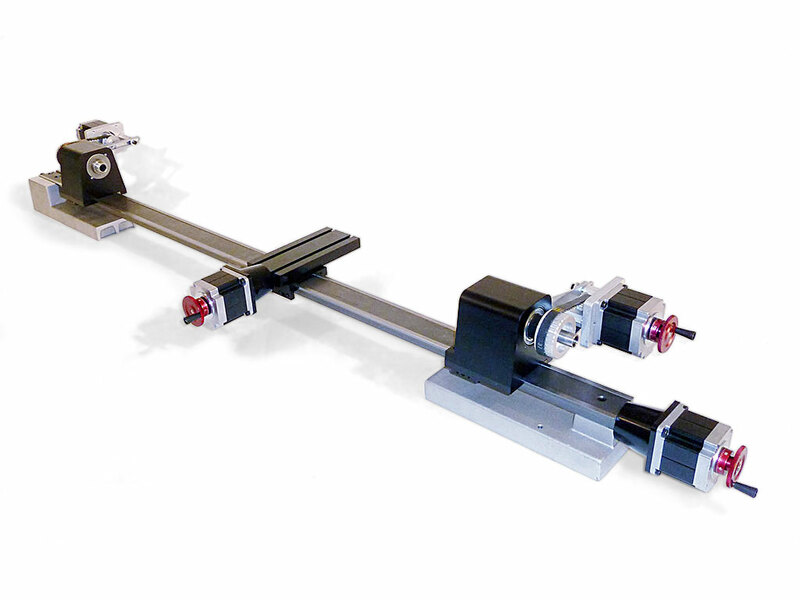 An adjustable counterweight is utilized to offset some of the weight of the fixture to take load off the stepper motor. The part is held in a 4-jaw chuck mounted to the lower rotary table. 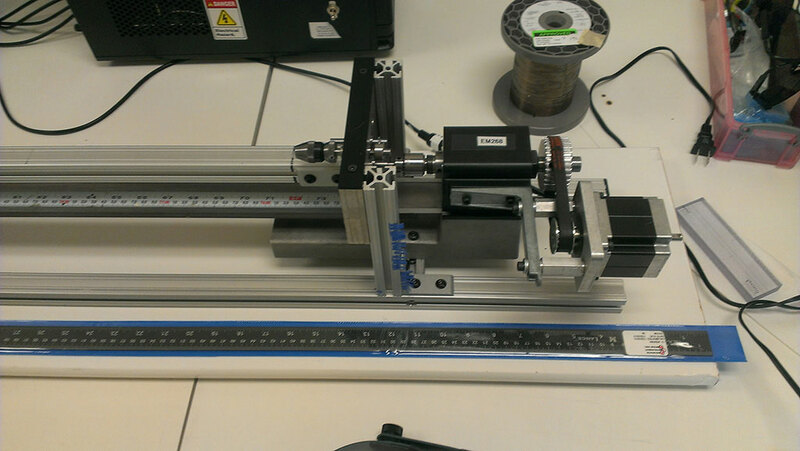 This machine was built by our customer using Sherline Products parts which included an extended spliced lathe bed, headstock and spindle with cog pulley, stepper motors, leadscrew, and Computer with LinuxCNC software. Designed to grind cam lobes for miniature engines, this small grinder has found its way into many uses in industry besides grinding cams. Software is provided that creates G-code from measurements of a cam lobe entered into a simple spreadsheet. The grinding wheel is 6" in diameter and a 1/4" wide, and a wheel dresser is provided on the back side of the cutting wheel. Available with or without a computer and drivers. Linux/EMC2 software included. 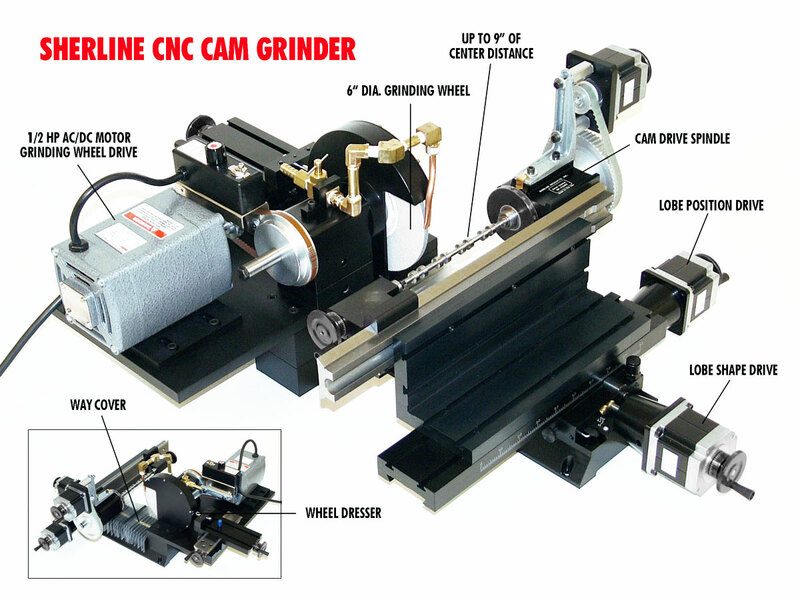 See CNC Cam Grinder for more details. 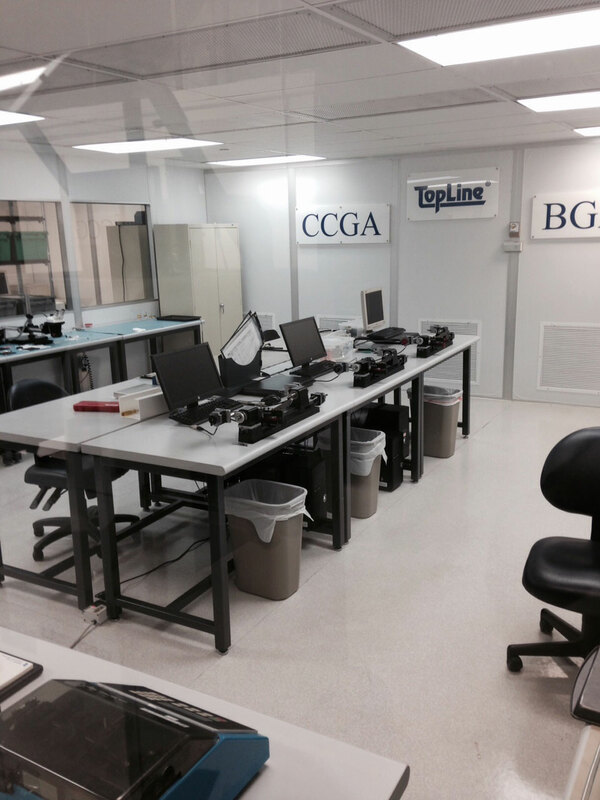 Sherline offers special coatings and materials to enhance the ability to use them in a clean room environment. 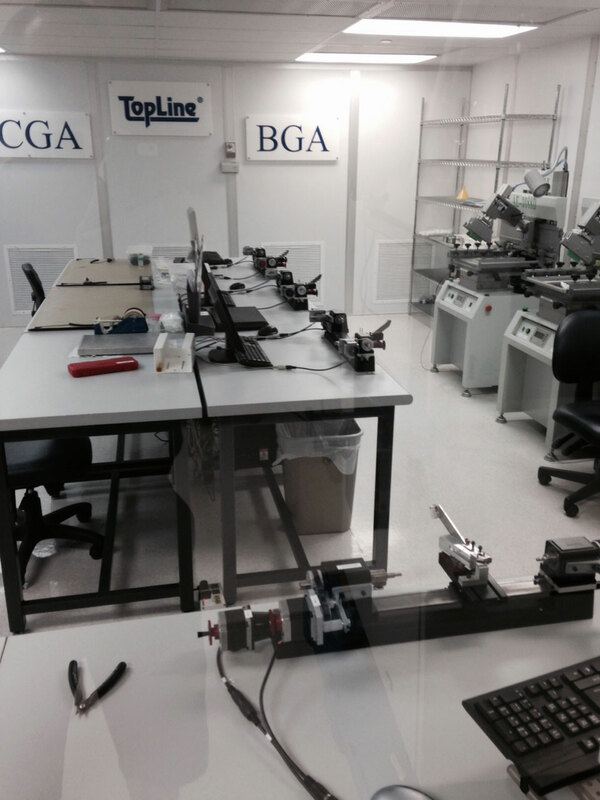 These photos show a typical lab set up with Sherline tools for making special parts.